At the end of last week the installation of our new stove was completed. The work involved enlarging the alcove for the chimney, tiling, decorating, fitting a flue liner and moving the heavy stove. 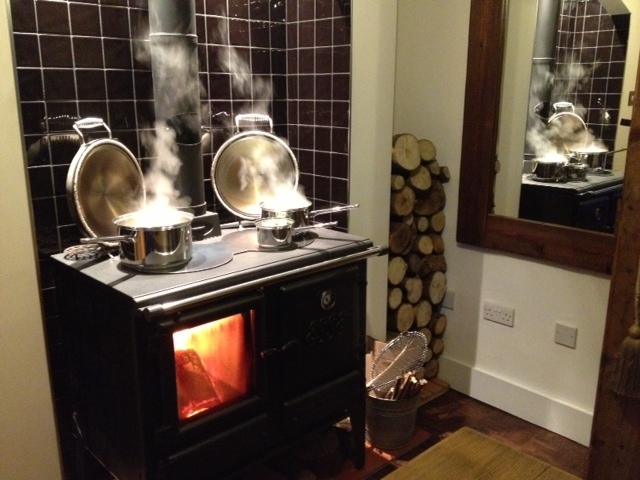 It's an Esse Ironheart range and we have fitted the wood burning box which converts it from multi-fuel to just wood. We already have an open fire in our living room so this is ideal for us. Over the weekend it was like having a new toy. We lit it Friday night and very quickly got far too hot. This is good because in previous winters our kitchen in our old house has been consistently cold and drafty. We had lots of cups of tea using the whistling kettle and by Sunday evening Shelley wanted to cook on it. 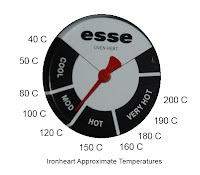 I had to get some idea of the temperature from the Internet and someone had kindly sat and measured and marked up a gauge which was close enough for us. I've done a Celsius version based on those measurements. I've also ordered an oven thermometer. Sunday dinner was cooked entirely using the range. It was amazing how quickly the hobs heated pans of cold water. We had vegetarian pie, boiled potatoes a selection of boiled vegetables, yorkshires and gravy. A very tasty perfectly cooked meal. All I did was bring the logs in and work out the temperatures, Shelley did all the cooking and stood in front of the very hot stove. This winter is going to be much warmer in our kitchen.